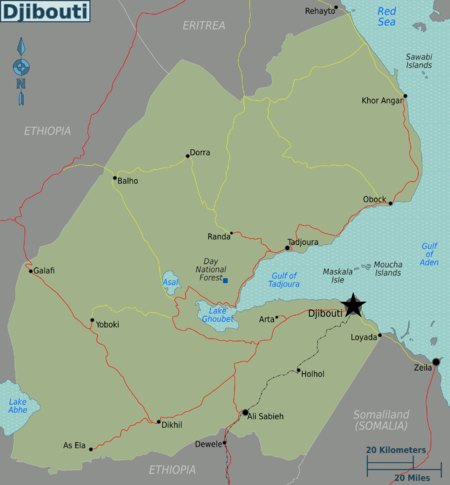 Djibouti  is in East Africa, bordered by Eritrea to the north, Ethiopia to the west and south, and Somaliland to the southeast. The Gulf of Aden lies to the east. The country can be divided into three regions; the coastal plain and volcanic plateaus in the central and southern parts of the country and the mountain ranges in the north. Much of the country is vast wasteland with virtually no arable land. Lake Assal is Africa's lowest point (157m below sea level) and the saltiest lake outside Antarctica. Its shores are largely salt pans and nearby is Ardoukoba, which last erupted in 1978. All visitors to Djibouti are required to have a visa. Depending on your nationality, there may be some differences on how long your visa is good for and if you need a visa prior to arrival or at arrival. Those travelling on EU and North American (USA/Canada) passports can get a visa on arrival for 10,000 DJF (3-day transit visa) or 15,000 DJF for a one-month tourist visa. The payment can be made in USD or Euro equivalent. You will need to show proof of return ticket as well as hotel reservation in Djibouti. Ethiopian Airlines will not board you on a flight into Djibouti if you do not have a ticket onward from Djibouti, even if you have a visa. The airline will sell you a ticket and tell you it is refundable, but it is not. 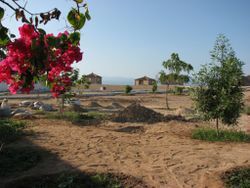 If you plan to enter by land you have to arrange for visas in advance. Visas can be obtained from neighbouring countries and where no Djibouti embassy exists, they can often be obtained from the French embassy. The types of visas include: Entry (visa de séjour); Tourist (visa de tourisme); Business (visa d’affaires); and Transit (visa de transit). Also, please note that batteries are not allowed in carry-on luggage, they must be stored in checked luggage or you may face confiscation. When leaving the airport, take care not to be overcharged for a taxi. There is a large sign outside that states taxi fares -- you should not be paying more than 2,000 Djiboutian Francs for a ride to the Kempinski or Sheraton. There are roads from Djibouti to Assab (Eritrea) and going west into Ethiopia via Dikhil. Travellers using them should be aware that road conditions are generally poor and personal security might be at risk when travelling – particularly to Ethiopia. Visitors are advised to check transit regulations as political conditions in Ethiopia and Eritrea are changeable. Currently, there are no problems with traveling to Eritrea and no formal border posts. Four-wheel-drive vehicles are recommended for the interior. There is a new highway from Djibouti to Tadjoura. Traffic drives on the right. It is advisable to carry water and petrol on any expedition off main routes. An International Driving Permit is recommended, although not legally required. A temporary licence to drive is available from local authorities on presentation of a valid British or Northern Ireland driving licence. There are ferry services connecting Djibouti to Yemen. Djibouti City is one of the main ports of eastern Africa so it's well trafficked. A new standard-gauge railway line links Addis Ababa and Dire Dawa with Djibouti; passenger services were inaugurated in January 2017. Djibouti E-visa is not recognised by Ethiopian immigration staff at Furi-Lebu train station in Addis Ababa, Ethiopia as a valid travel document. Only a visa issued by a Djibouti embassy on passport is considered valid due to non-availability of computer at the Ethiopia-Djibouti border crossing. Taxis are available in Djibouti and from the airport to the town, the price is fixed and displayed on a billboard on the exit towards the parking area; also in Ali-Sabieh, Dikhil, Dorale and Arta. Fares can increase by 50 percent after dark. Sheraton Hotel offers free airport shuttle, but you need to order it in advance. Although the official languages are French and Arabic, the most common native languages of the local population are Somali and Afar. Omani Arabic, Amharic, Greek and Hindi are also spoken by smaller numbers. English may be spoken at tourist facilities, but is not widely spoken by locals or taxi drivers. Kayak - The Gulf of Tadjoura has some of the most pristine waters in the world. You can paddle for hours to untouched reefs for snorkeling and isolated beaches. Khat: A leafy stimulant popular with the locals. The herb is flown into the country each morning from Ethiopia and arrives by truck in Djibouti's Central Market at about 1PM. It is fairly inexpensive, but quality varies greatly, so shop with caution. PROVISO: If you are prone to indulge, discern whether this is a good idea, as you are in a foreign country and may be placed under suspicion as a foreign visitor for partaking in acts illegal in your country of origin. Take care! In addition, Khat may not be taken out of Djibouti through the airport and use and possession by foreigners is not encouraged - you may be subject to police involvement, as it is considered a controlled substance in some other countries, or illegal. Conversion between DJF and USD is fairly stable as the DJF is tied to the dollar. You can convert dollars to francs with local street money changers located in the Djiboutian market area for 175 DJF to $1 USD. The street money changers are ladies who line the street waiting to convert USD to DJF. They are generally honest brokers. Have your calculator ready and make sure to ask in advance what the conversion rate is, if they quote you anything less than 175 go to another broker. Most all of them speak a little English. The city of Djibouti has many places to eat as well as tourist traps. If you are interested in western cuisine, be prepared for sticker shock. If you are interested in good local cuisine, then you and your pocket book will be happier for the experience. For example, the Ethiopian Community Center offers a wide variety of dishes with a local flair which are very tasty, safe to eat, and reasonably priced. Best to avoid places that the tourists hang out at, and you will be happier for the experience. Average price per meal outside of a tourist trap: $4 including drink. "Hotel Horseed" 6000djf per night for a twin room with ceiling fan and AC. Shared bathroom with western-style toilet. Also terrorism is a threat. Health insurance is advisable. Doctors and hospitals may expect immediate cash payment for any medical treatment. A yellow fever vaccination certificate is required from travelers over one year of age coming from infected areas. Cholera is also a serious risk and precautions are essential. Up-to-date advice should be sought before deciding if these precautions should include vaccination as medical opinion is divided over its effectiveness. Typhoid immunization is usually advised. TRAVELLERS HEALTH ADVISORY: Malaria risk exists via mosquitos, predominantly in the malignant falciparum form year round (http://en.wikipedia.org/wiki/Plasmodium_falciparum). Strains resistant to chloroquine have been reported here. Mefloquine, doxycycline or atovaquone/proguanil are recommended. The adult HIV/AIDS prevalence rate is currently at .91%. The 13th French Foreign Legion Demi-Brigadeis (13ème DBLE)(http://en.wikipedia.org/wiki/13th_Demi-Brigade_of_the_Foreign_Legion), was permanently stationed in Djibouti, and consisted of about 800 men. They redeployed to the United Arab Emirates on June 13th, 2011 13ème Leaves Djibouti. There is also a 2,000 person plus U.S. military presence in Djibouti, located at Camp Lemonnier (http://en.wikipedia.org/wiki/Camp_Lemonnier) across the runway from the international airport.